What prompted the artist Robert Motherwell to devote over 40 years, from 1948 until his death in 1991, to a body of work entitled “Elegies to the Spanish Republic”? Why did Motherwell, whom the noted critic Clement Greenberg considered “one of the very best of the Abstract Expressionist painters,” return to this theme in nearly 200 monumental canvases? How did a body of work that helped invent the formal language of abstraction come to engage with such strong political, philosophical and literary content? The 76th anniversary of the International Brigades seems a fitting time to examine this series by Motherwell, who spent most of his 76 years in “private insistence that a terrible death happened that should not be forgot” — the destruction of Spanish democracy by General Francisco Franco. Fortunately for Spanish history enthusiasts, Motherwell wrote many essays and commentaries on his artistic process and the ideas that engaged him throughout the course of his life’s work. Although he began the series almost 10 years after the fascist attack on the Republic, the artist recalled, “I was 21 in 1936 [when the Civil War broke out], and that was the most moving political event of the time.” In 1937, Motherwell attended a rally in San Francisco, where he heard French author and advocate for the Spanish Republic, Andre Malraux, speak on the Spanish Civil War. In those early years after the “terrible death,” the artist found the decisive moral issue that would be reflected in all his life’s remaining work. The series had its beginnings in the painting At Five in the Afternoon. The title is a line from the poem The Goring and the Death by Federico García Lorca, lamenting the death of the legendary matador, Ignacio Sánchez Mejías, who was mortally wounded by a black bull in 1934. In the poem, Lorca repeats the phrase “at five in the afternoon” 28 times, just as Motherwell would repeat his abstract arrangements of flat black and white ovoids and columns in the Elegy series. Here Motherwell paints the poem, using Lorca’s metaphor for the death of the Republic as his own visual lamentation for the poet and the Republic’s death at the hands of the fascists. 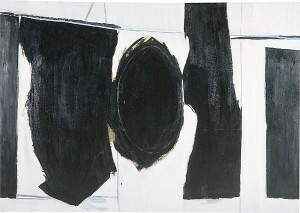 Lorca used the term pena negra, or “black grief,” which Motherwell said characterizes his alternating black abstract shapes. Guernica, the other great 20th-century masterwork response to fascist brutality in Spain, employs a stylized bull motif to provoke images in the mind of the horrors of war. However, while Picasso went on to work in many other formats and media, Motherwell would revisit the motif and style of At Five in the Afternoon with the intensity of a series of Bach cantatas until they became the style most associated with Motherwell. Black columns vary slightly moving through the Elegy series. At times they form borders, suggesting columns of architectural structures such as temples, mausoleums or coffins. They sometimes compress the oval shapes, which Motherwell said initially represented a bull’s testicles — a direct response to Lorca’s poem. At other times the ovals seem to break free of the oppressive columns. Black grief is set in contrast to a white background, through which the artist strove to evoke the light and liveliness of Matisse. Though The Persistence of Memory is the title of one of Catalan surrealist Salvador Dalí’s best known works, it could easily serve as subtitle for Motherwell’s omnipresent Elegies. Motherwell raised his voice in lamentation with his mural-size works in major museums throughout the United States, even during the cold war period when Franco was an ally. Variations on the Elegies are in the collections of the San Francisco Museum of Modern Art (SFMOMA), the Metropolitan Museum of Art, Yale University, the Albright-Knox Gallery, Washington D.C.’s Phillips Collection and the National Gallery of Art, the Whitney Museum of American Art, the Solomon R. Guggenheim Museum, the Denver Art Museum, the Los Angeles County Museum of Art and many more. These visual testimonials travel internationally and are now in the Tate Modern of London, the National Gallery of Australia and the Reina Sofía in Madrid. Motherwell’s testament to the historical memory of the Spanish Republic was prescient of the Spanish grass-roots movement that has spent the last decade reclaiming their history and fighting modern forces of fascism. Nancy Wallach, an art teacher in New York, serves on the ALBA Board of Governors. I have been drawing, painting and studying Art most of my 86 years. This is not Art. Your eye tells you. No story about the Spanish civil war can change the fact that it is not Art! For those with eyes to apprehend the inner life of these paintings, Motherwell’s Elegies are among the great abstract paintings of the Twentieth Century, ranking with Rothko’s late paintings-his color series.